Do you perform post-trade analysis? 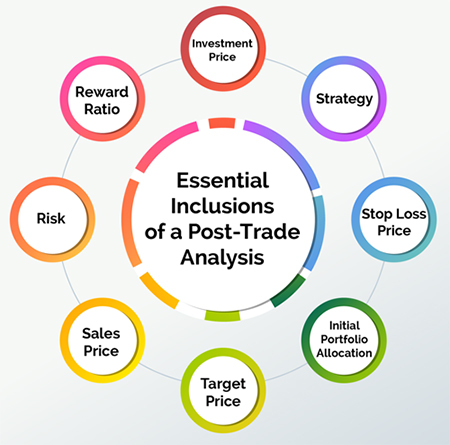 To figure out what they did wrong while trading and what can be done to avoid further losses, successful investors perform post-trade analyses. Why did I lose money on my investments? What can I do to make a profit? What strategy should I use? These are some common questions every investor asks at a certain point. To find the answers to these questions, you have to figure out what you did wrong while trading and what can be done to avoid further losses. Successful investors perform post-trade analyses to find the answer to these questions. You are responsible for your fate. Only you can control and maintain your portfolio. Saying that you only invested because someone else said so will always lead to losses. To answer the ‘WHO’ question: It's you who has to do all the work in order to earn profits on your investments. While it is not as relevant as the other ‘W’s, it can help you understand the pattern of your decision-making. For example, if you mark your trades with the place you took a particular decision, like on a vacation or at work, etc. you can know if you make poor decisions while in a particular environment. This constitutes the date you made the trade for a particular investment. Post-trade analysis requires you to mark your trades with the specific date of purchase. It is the most critical factor in the process of post-trade analysis. The ‘WHY’ factor includes your explanation of why you purchased a specific investment and what you were thinking while buying it. For example, you can write: “The company seemed good, and there was a scope for growth in the future. The share prices were in my budget, and the target price seemed achievable.” This will allow you to understand your decisions and you can improve your trading process in the future. Make an excel sheet of all your trades and update it with answers to the questions mentioned above. The excel sheet should ultimately provide information about your profit or loss and the return percent on a particular trade. Always try to pull up the stock chart of your investment and take a screenshot of the relevant time frame. The time frame can differ according to the trading method. If you are a day trader, you have to take the screenshot several times in a day, and if you are a long-term investor, you can wait for a week or two to take the screenshot and log it in your excel sheet. You can open your excel sheet and mark your trades with the relevant technical analysis having buy points. You can put arrows or any other sign to mark where you bought and sold the security along with the percentage of your position (20%, 25%, 50%). It will enable you to understand how a particular trade played out in the end. Note everything mentioned in the 'WHY' factor. It is fairly possible you will not remember what your state of mind was when you purchased a security at that time. Therefore, it is important you immediately write this information along with your trades to make your investment process better in the future. After you have marked all of your trades with the relevant information, it is time that you review and analyze what you did right and what went wrong. This overview is one of the most important aspects of the post-trade analysis process. It will allow you to know if your strategy is good enough to let you make profits in the market or you should consider improving or changing the strategy for better results.